Did you know that along with our Christening outfits, we also carry a large selection of Christening gifts? 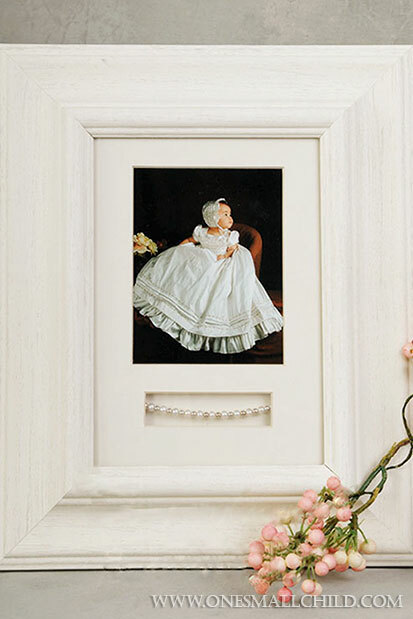 Among our baby gifts are keepsake baby frames. We offer baptism frames that have special sayings or scripture verses. We have godparent frames that are perfect for gifting. Choose pink frames for your petite princess or blue frames for your little gentleman. Many of our frames can be personalized, too. 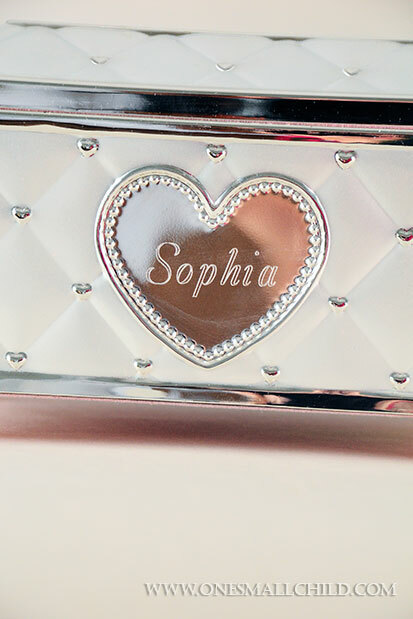 Our engraving and embossing options make for a fun and unique gift. 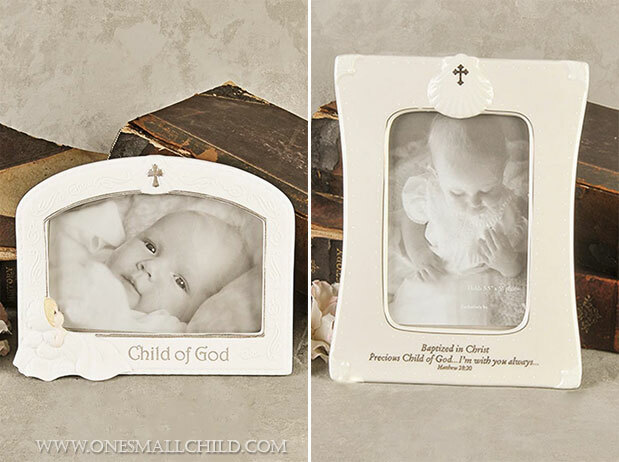 Take a look at a few of our baby frames-perfect for displaying a favorite portrait of your precious little one! See more baby frames here. Join us on our Spring outing to the farm! 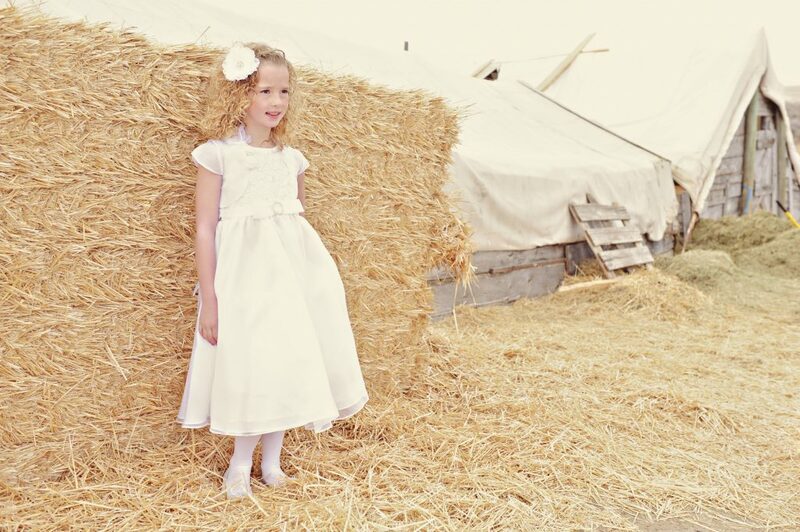 We had so much fun with these beautiful kids and all the darling lambs – see the photo shoot images here: Part 1, Part 2. See more personalized baby gifts from One Small Child! We hope you had a lovely Easter! Here is Part 2 of our Little Lambs photo shoot: this charming baby boy was in his element! Looking back at all the dresses and suits we’ve made over the past 30 years has us feeling rather nostalgic. Each product has offered something special and unique to our customers. We’ve always enjoyed seeing our clothing worn by your children and babies throughout the years. And we *love* hearing what makes it special to them and you! All this reflection has made us want to share this trip down memory lane, so we decided to do a customer photo contest! We want to see your photographs – old or new – in any of our product over the years. Tell us what made it special to you! How did wearing it make you or your child feel? What design characteristics did you like about it? What event did you or your little one wear it for? Just for fun, we’re going to give away two $50.00 shopping codes: one credit will go to one randomly selected photo, the other will go to the photo with the most likes! So dig out those old pics of you and your friends in Fluff N’ Twirl, Allie Wade and One Small Child dresses! Show us your nephew in his handsome blessing outfit! 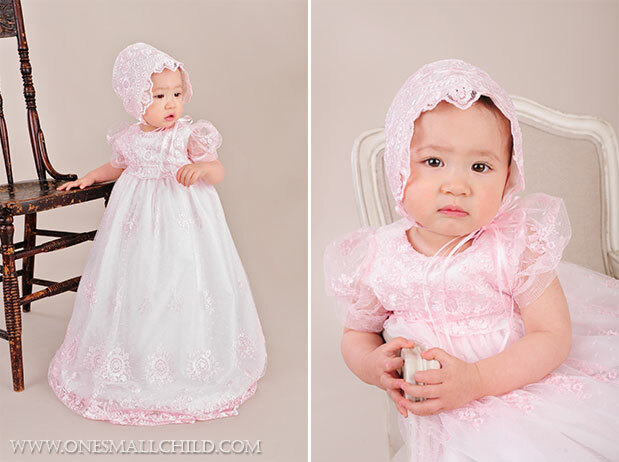 Share a snapshot of your granddaughter in her christening gown! Whether it was five days or fifteen years ago, if we made we want to see it! To enter, simply upload your photo to our Customer Photo Contest page on Facebook, here. Encourage your friends and family to like it! We’ll accept entries through 11:59 pm mountain time on May 14 and announce a winner on May 15. Good luck! 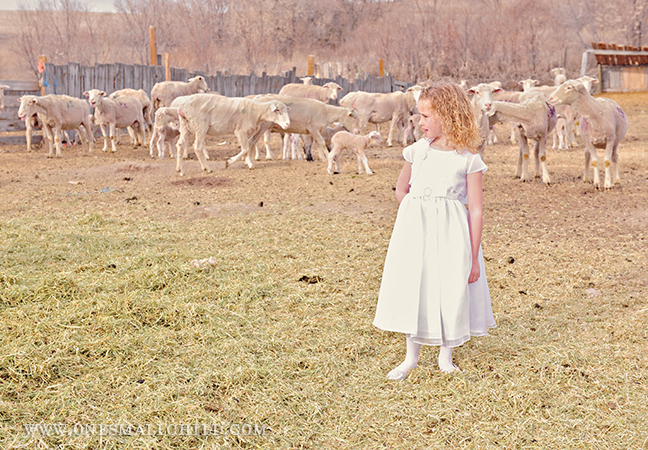 We recently spent a gorgeous Saturday morning photographing two new girl dresses with this lovely girl and a flock of brand-new lambs. The light was soft, the lambs were sweet, the setting rustic. I love the beauty that can be found in ‘ordinary’ places. Don’t you? Have you seen our gorgeous Caryssa Christening Gown? It’s made from pink embroidered French netting that’s simply heavenly-not to mention silky smooth! Our designers chose pretty puffed sleeves, giving it a girly flair. Flowing ribbon streamers tie at the waist and headband, leaving cute layered bows. A stunning heirloom length is absolutely elegant. The set includes a matching bonnet and cotton slip. You can personalize the slip with baby’s name, Christening date or any of our other embroidery options. This gown has received a five-star rating from our customers, and is a staff favorite. 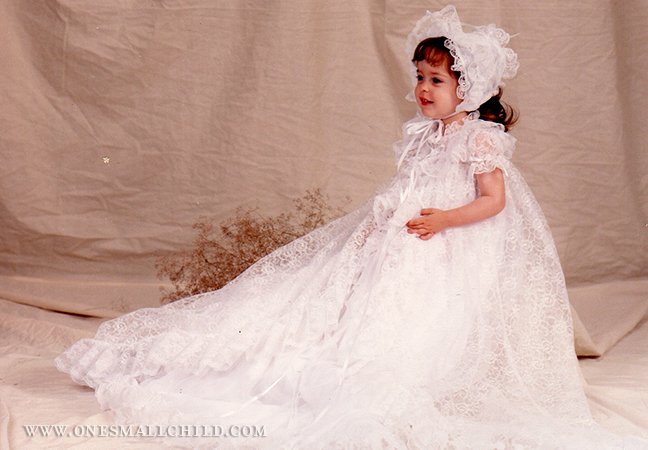 All this makes the lovely Caryssa Gown our top Christening Gown pick for Spring 2014! Accessorize the Caryssa gown with the matching Caryssa Lace Slippers. The Lace Bow Headband and Lace Rosette Headband also match flawlessly! A lot changes in thirty years. 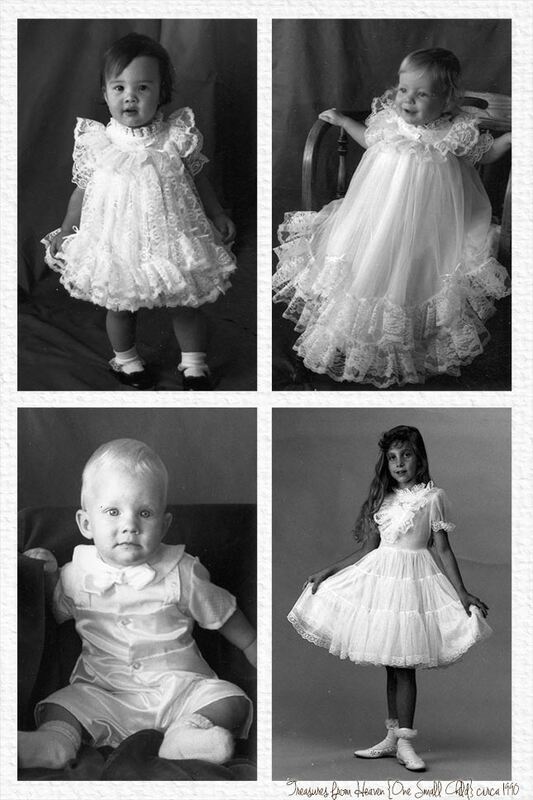 Our company, now known as One Small Child, began in 1983 with a line of bouffant slips for girls called Fluff N’ Twirl. They were soft and frilly and each featured a tiny bit of marabou fluff. 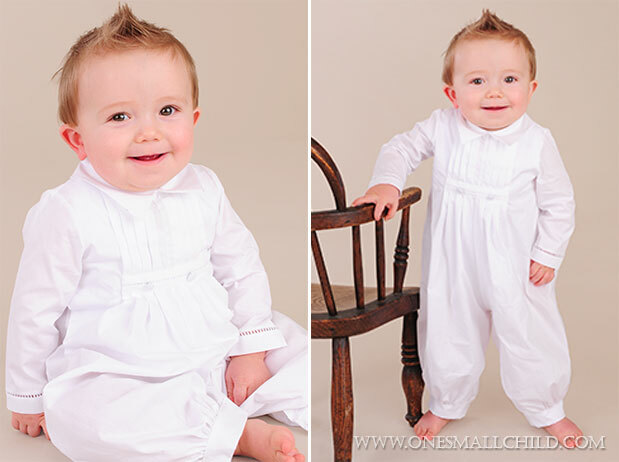 The line soon expanded to include ruffly christening gowns and then…cute outfits for boys! But that presented a question: does ‘Fluff N’ Twirl’ belong on a tiny christening suit meant for a baby boy? With the expansion of our girls’ line to include boys, Ramona named her line ‘Treasures from Heaven’ as a nod to how she felt about all children. Every one really is a treasure. Under this name our design aesthetic kept the original frilly roots and soon added more sophisticated silhouettes. In 2004, it was time for a new direction, and a new name fit the bill. ‘One Small Child’ was born, with the idea that one small child can change the world. Every individual is of worth; every one of us has the ability and opportunity to make a difference by the choices we make and the actions we take. Every one of us has beauty to share and love to give and lives to touch. That is the underlying belief and power of One Small Child. The products we design and offer are meant to honor that inherent potential in every child who wears and loves them. And so, that is the story of the name game. We are so appreciative of the thousands of customers over the years who have supported our company. To show that appreciation, we’ll be announcing a fun contest for all past (and present) customers next week…stay tuned! Nothing’s more fun than a barrel of monkeys…except this sweet tote full of them! 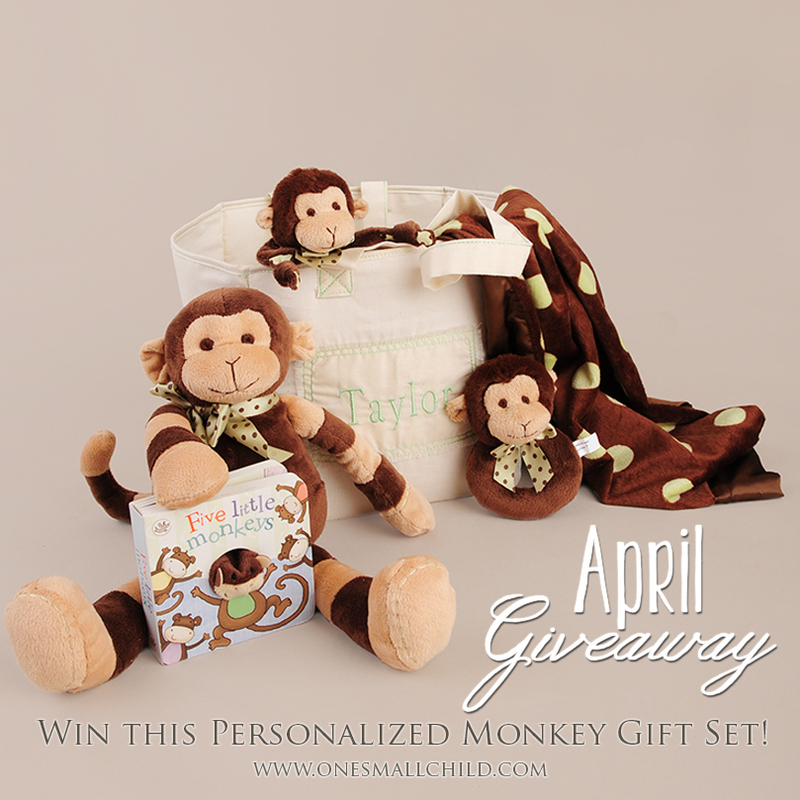 For our April Giveaway (we’re celebrating our 30th year of business with monthly giveaways), we’re offering one of our adorable monkey personalized baby gift sets, and we want YOU to win it. Good luck! 1-customized muslin tote, a $78.00 value.